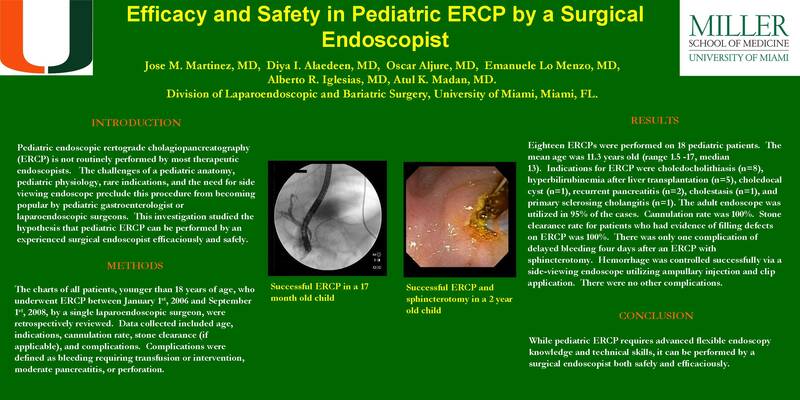 Introduction: Pediatric endoscopic rertograde cholagiopancreatography (ERCP) is not routinely performed by most therapeutic endoscopists. The challenges of a pediatric anatomy, pediatric physiology, rare indications, and the need for side viewing endoscope preclude this procedure from becoming popular by pediatric gastroenterologist or laparoendoscopic surgeons. This investigation studied the hypothesis that pediatric ERCP can be performed by an experienced surgical endoscopist efficaciously and safely. Methods: The charts of all patients, younger than 18 years of age, who underwent ERCP by one laparoendoscopic surgeon were retrospectively reviewed. Data collected included age, indications, cannulation rate, stone clearance (if applicable), and complications. Complications were defined as bleeding requiring transfusion or intervention, moderate pancreatitis, or perforation. Results: Eighteen ERCPs were performed on pediatric patients between January 1st 2006 and September 1st 2008. The mean age was 11.3 years old (range 1.5 -17, median 13). Indications for ERCP were choledocholithiasis (n=8), hyperbilirubinemia after liver transplantation (n=5), choledocal cyst (n=1), recurrent pancreatitis (n=2), cholestasis (n=1), and primary sclerosing cholangitis (n=1). The adult endoscope was utilized in 95% of the cases. Cannulation rate was 100%. Stone clearance rate for patients who had evidence of filling defects on ERCP was 100%. There was only one complication of delayed bleeding four days after an ERCP with sphincterotomy. Hemorrhage was controlled successfully via a side-viewing endoscope utilizing ampullary injection and clip application. There were no other complications. Conclusions: While pediatric ERCP requires advanced flexible endoscopy knowledge and technical skills, it can be performed by a surgical endoscopist both safely and efficaciously.